My first AHRA meeting was the 2007 Fall Conference in Savannah, GA – a beautiful location! I had been a manager for only a few months. My director was very supportive and encouraged me to attend the Basic Management Skills Track. I really did not know what to expect but received much more than I could have imagined. The sessions offered tools, resources, and real life experiences to mold me into the leader I wanted to be. The topics covered so much in a short period of time, but the information was absorbed, utilized, and put into action. The most vivid lesson I recall concerned leadership styles. There was a simple step to leading and educating others that made me stop, think, and set a goal to achieve: when others falter or make mistakes, reflect first on what and how I taught them. Most likely, the barrier in learning was due to my delivery. What could I do differently to teach that person the process and encourage them to ask for help? It was a powerful moment for me that truly caught my attention (this is important because I was fascinated by the barges floating past the classroom windows!). I remember feeling in awe of the accomplishments of the radiology professionals who presented the course information. I was inspired by their adventures and journeys in medical imaging. The presenters, diverse in their backgrounds, set the stage for me and my future career. I knew from that point on that I too could continue learning and have a story similar to one of theirs. My first AHRA meeting truly set the tone for what was to come in my professional career. I met awesome people, had beautiful scenery, gained valuable lessons, and became inspired. That was 8 years and several credentials ago, but I remember and value that experience immensely! 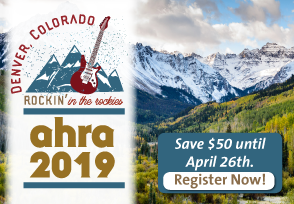 I encourage radiology professionals to attend an AHRA conference no matter what point they are at in their career – the experience and connections are invaluable. What was the first AHRA meeting you ever attended? Send your story to Kerri Hart-Morris (khartmorris@ahraonline.org), and it could be published here too! Carla M. Knisley, CRA is the imaging manager at OhioHealth in Columbus, OH. She can be reached at carla.knisley@ohiohealth.com.